What makes one REALTOR® website stand out over another? Why are your competitors’ website ranking higher and getting more leads? In this article, you’ll discover over 25 of the best real estate website features that set apart the best from the average REALTOR® website. 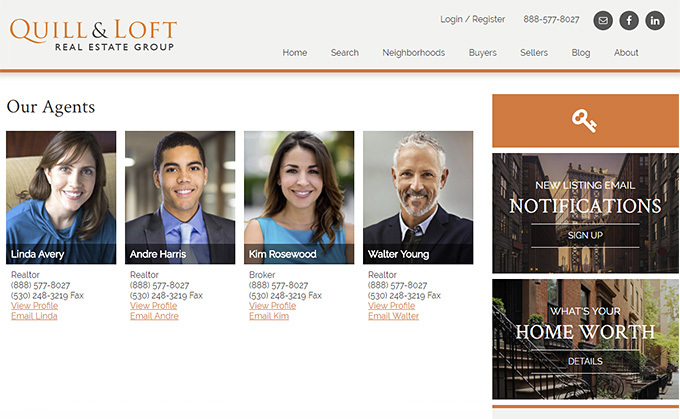 What’s the point in using a REALTOR® website that looks nice, but lacks the essential tools and features that can take your website from looking good to doing GREAT? While some of these features may seem obvious, there are several platforms marketed toward REALTORS® which amount to a visual business card and not much else. A great website means starting with the must-have tools in your website tool box and exploiting them to generate and capture new leads. 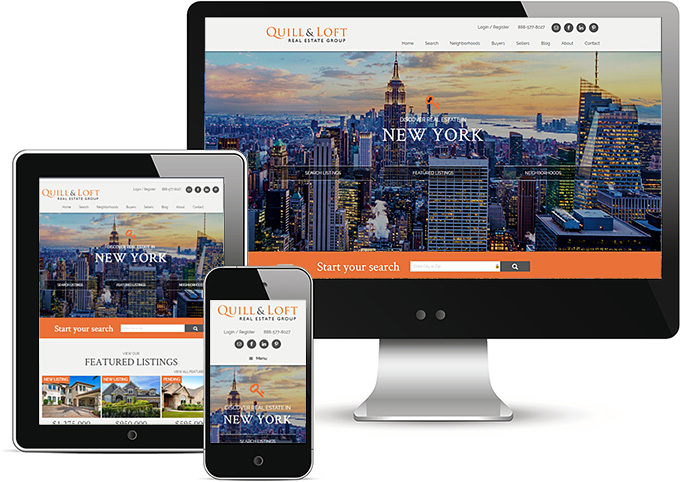 Professional Mobile Responsive Design – Invest in a professional website that is mobile responsive and caters to over 65% of visitors surfing on a mobile device – don’t lose them right off the get-go. Google has indicated a growing preference for responsive web design. 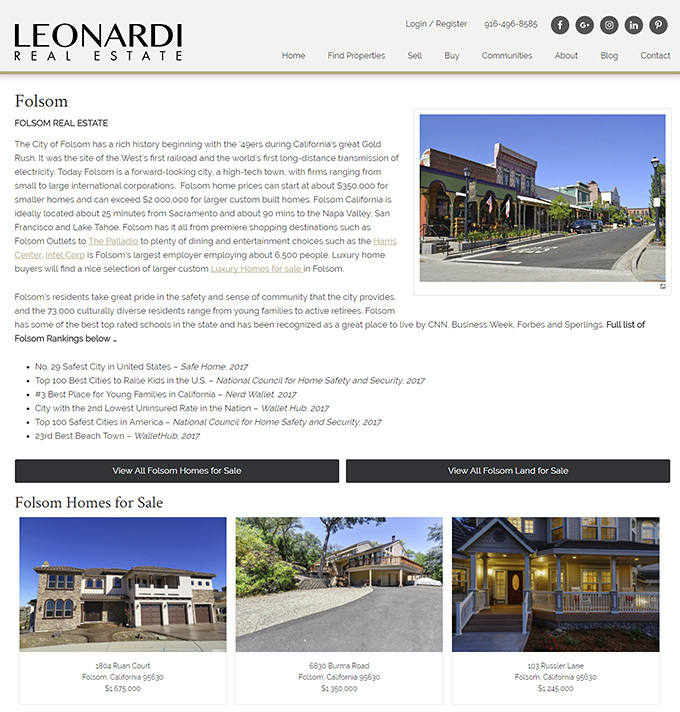 Read Why Switch to a Responsive Real Estate Website to learn more. Here at Moineau Design, IDXCentral.com, we have served over 4,000 real estate professionals and have a solid understanding of what it takes to develop a top-performing website. A Website You Own – Invest in a professional website that YOU OWN so that all your time, money and SEO success stays with you. As you grow, it grows. Many agents lease a company site or purchase a proprietary, developer owned website only to find they are forced to leave it all behind when their situation takes a new turn, whether it be a change in office or a great cost increase with their existing site. Our real estate websites are built on the popular and easy to use WordPress platform that rank in search engines, and allow you to maintain ownership. Advanced IDX (What is IDX?) – Not all IDX solutions are the same. You want a powerful IDX solution buyers prefer with must have features like Indexable Listings for SEO, Advanced Search Fields, Quick Search, Map Search, Detailed Listing Information, Sold Data, New Listing Email Notifications, Market Reports, Featured Listings, and Forced and/or Opt in Registration options, to name a few. Google Analytics – Analyze your visitors behavior with a free Google Analytics account. View organic referrals and paid ads to see where your efforts are paying off. View our article on How to Set Up a Google Analytics Account. Fast Loading – Make sure your site loads quickly so the search engines don’t ding you, and your audience won’t leave before it loads. We host sites on fast–not overtaxed–servers. If fast is your focus, let us show you how it’s done right. SEO Tools – You want a site that offers the tools to optimize your site for SEO (Search Engine Optimization). If your goal is to rank well in search engines, learn some basic SEO tips to get started, or hire a professional. We recommend Yoast SEO for great online SEO information and preinstall this #1 WordPress SEO plugin with our semi-custom and custom real estate websites. We also include Yoast’s premium plugins: Video SEO for WordPress, Local SEO for WordPress (a $138 value). Lead Capture Forms – Gain new leads by with lead capture forms i.e. What’s My Home Worth, New Listing Email Notifications, Free Relocation Guide, Buyer and Seller Tips, emailed Market Reports (consider MarketBoost) etc. Detailed Market Reports – Offer detailed, up-to-date market reports giving your professional perspective and/or reference industry news articles. Consider using MarketBoost, a great drip marketing too, which offers the ability to email updated reports to your clients directly. Neighborhood Pages – Develop detailed neighborhood profile pages complete with a photo gallery and/or video to build your credibility as a market leader in the area. These pages create powerful SEO content and easily display homes for sale in each neighborhood to satisfy your visitors’ quest for available listings. Featured Listing Pages – Have listings? Feature your listings by creating featured listing pages with extra description, photos, PDF floor plans, etc. These pages are a great opportunity to include more SEO keywords and help you win more listing appointments. Virtual Tours – Create a virtual tour of your listing for use on your featured listing page, on social media and your YouTube channel. Showcase your marketing skills and put the spotlight on your exclusive listings. Buyer Information – Include helpful buyer information i.e. Home Buying Process, Relocation Info, Real Estate Terms, Schedule a Tour, Home Buying Basics etc. Use this valuable information to capture leads and generate additional SEO content. Stellar Biography – Write a professional, persuasive real estate agent biography to help build on your personal brand and connect with clients. Stunning Agent Roster – Showcase agents with an easy-to-manage agent roster. Let each agent stand out and at the same time create more content rich pages for SEO ranking. Mixed Media – Add mixed media, such as real estate videos, ebooks, PDF literature, infographics and blog posts that appeal to a variety of audience members (some people are more visual, while others would prefer to read, etc.). Calls to Action – Utilize a sidebar with “call-to-action” buttons that can capture a lead on any page of your site i.e. What’s My Home Worth?, New Listing Notifications, Relocation Guide, Buyer Tips, etc. Calls-to-action also are great for your home page to direct the visitor. Raving Testimonials – Promote choice testimonials on the site either in a sidebar, home page and/or a full testimonial page. Landing or Squeeze Pages – Offer a landing page created to capture opt-in email address (a “squeeze page”) in order to build your list of leads. SSL Certificate – Consider getting an SSL Certificate to keep data secure between servers, increase your site’s Google ranking, and build customer trust. We offer free SSL Certificates with our hosting plans, whereas other outfits like GoDaddy.com charge. The Right URL – Purchase a keyword-rich domain name relevant to your local market or a URL that helps brand you – something simple and easy to spell. You can research find names at Instant Domain Search or GoDaddy.com. Getting Social – Add social media buttons using the appropriate icons and encourage leads to follow you. Post these to media outlets to engage and show you’re a whiz with online marketing techniques. Market via Blog – Include a blog with valuable topics your visitors can connect to. For blog topics, see our article on Real Estate Blog Ideas – Your Resource Guide. IDX on Facebook – Add IDX to your Facebook account to gain additional traffic to your website. Easy to Reach – Ensure your contact information is visible on every page. Educate via Resources – Educate your visitors with a comprehensive online resources section to cover local schools, popular community organizations and local resources. Set a High Standard – Go the extra mile and learn to manage your website so it becomes second nature – your site is your BEST marketing tool. WordPress real estate websites are easy to maintain and by far a preferred industry-leading product. Need a powerful new website and IDX solution? Having a powerful real estate website that you own, has become an invaluable tool for REALTORs®. It’s an engaging way to generate new leads and connect with today’s clients who expect their REALTOR® to be marketing online. With our WordPress real estate websites, hand-designed by our talented designers, you can leave the creative design work to us. Our great support staff will help train you so your new site up and running smoothly. Having served over 4,000 REALTORS®, we have a solid understanding of real estate website design, IDX sales and integration. We would love to show you what we can do for you. Thank you for sharing such an important and useful article with us. Use of internet for the promotion of business increased rapidly. Internet has the potential to convert a local brand into an international brand. However, development of website should be done in such a way that we could attract the potential customers. We could use social media in order to promote the business in the global market. Apart from this, website needs to be optimized according to the google in order to increase the visibility of the website which could enhance the productivity.